Jane Austen fans, as you probably know, do a lot of re-reading. Given we only have six complete novels, plus her juvenilia and a couple of unfinished novels, we have little choice. Fortunately, it’s not a chore! 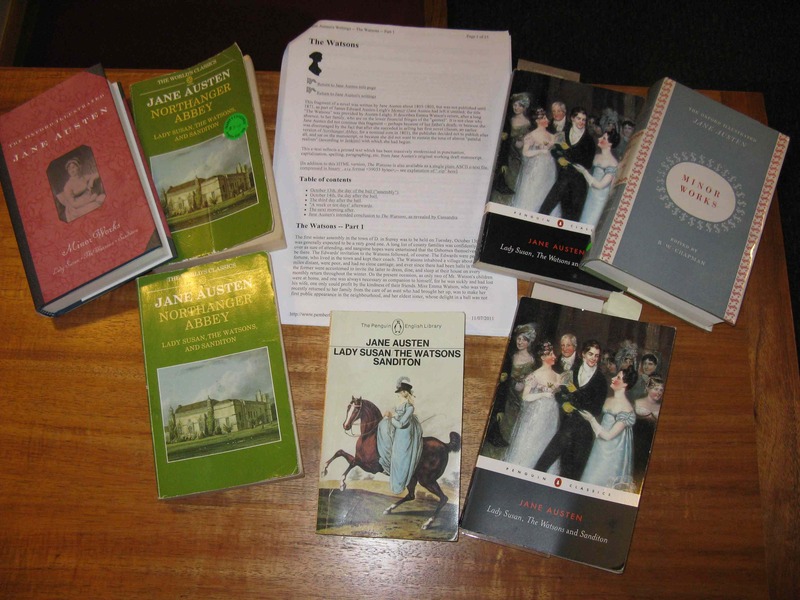 And so, having completed rereading all her novels over the last few years for their respective 200th anniversaries, my local Jane Austen group decided to return to her two unfinished novels, starting this month with The Watsons. This was the third time we’ve done it in our relatively short existence. We did it in 2008 and again in 2011 (at which time I wrote my own reflections for this blog). I do not plan here to write a “proper” review, so if you are interested in my thoughts, please check the link above. However, there are a couple of additional comments I’d like to make, starting with the question I posed in my 2011 post. The question relates to its unfinished nature. There are in fact two main questions regarding this: why did she stop writing it and why didn’t she pick it up again? And here I’ll quickly recap the novel’s background for those who don’t know it. The Watsons was written in Bath probably around 1803-1805, though there isn’t complete consensus about this. It’s commonly believed that she abandoned it after her father’s death in 1805 because of sadness and the resultant uncertainty in her living conditions. Whether this is true or not, it is true that she didn’t take up serious writing again until she settled in Chawton in 1809. Now, it was at Chawton that she took up two earlier works, which became her first two published books, Sense and sensibility and Pride and prejudice. Why did she not then take up The Watsons and rework/finish it too? This is the more interesting question, I think, than why she stopped it in the first place. There are some theories around, though I haven’t investigated them thoroughly. However, her nephew James Austen-Leigh, who wrote the first “memoir” we have about her life, conjectures that Austen had become aware of “the evil of having placed her heroine too low, in such a position of poverty and obscurity” but I’m not sure I buy it. No, my idea is different. The Watsons is broadly about four sisters and their marriage prospects – as is Pride and prejudice and Sense and sensibility. When we look at The Watsons, which Austen started after drafting those two books, we can see characters and storylines which remind us of these first two books. And so, I wonder whether, having published P&P and S&S, Austen felt she didn’t have enough new ideas to add to this storyline and wanted to try something different. Certainly, the next book, Mansfield Park, was something different. The marriage plot is still there, but it’s about a poor relation who is taken in by her wealthier ones. The interesting thing is that The Watsons commences with the return of 19-year-old Emma Watson to her family having spent 14 years with a wealthy uncle and aunt. Perhaps Austen decided to explore the story of the poor relation from a different angle, from the time of arrival at the new home? Another thing about The Watsons is that as well as having characters who remind us of those first two novels, it also has characters reminiscent of some in later books, particularly in Emma. This suggests that while she didn’t finish The Watsons, her work on it wasn’t wasted – and she knew it. We’ll never know of course. There’s so much we don’t know about our Jane, but it is fun trying to fill in the gaps. There’s more I could explore about this tiny fragment of around 17,500 words, but I’ll save those for the next re-read! Instead, I’ll conclude with two excerpts which grabbed my attention this time. Here we see Emma’s mettle. She stands up to Lord Osborne – to his assumptions about women and to his obliviousness that not all people have the means he has. The evils arising from the loss of her uncle were neither trifling, nor likely to lessen; and when thought had been freely indulged, in contrasting the past and the present, the employment of mind, the dissipation of unpleasant ideas which only reading could produce, made her thankfully turn to a book. So, even in 1805, reading was seen as a way to occupy the mind and so escape, for a while, the troubles of life. Thanks Bill. I have seen that Jenkins suggestion re “morbidness”. In fact hers and Austen-Leigh’s are the only ones Ive seen, but I haven’t researched the literature. I’m not sure I totally agree with her either. It’s interesting that some people see The Watsons as morbid – even from the fragment without knowing Austen’s plans – while others of us don’t see it quite that way. This is a fascinating post. I have read all of Jane Austen’s full length, completed novels but I have not read The Watsons. Your commentary makes it sound very appealing. How an author’s ideas evolve is usually interesting to me. You make a convincing case that the origins of the plot and themes found in other Austen books can be found here. Thanks Brian. If you like Austen, then her two unfinished works – The Watsons and Sanditon – are well worth reading as is her juvenilia. They provide such insight into her ideas and, particularly with her juvenilia, her development.